SUPERCORSA SC V3 - 2019 has been completely redesigned in terms of structure, profiles, tread pattern and compounds based on a more consistent performance. 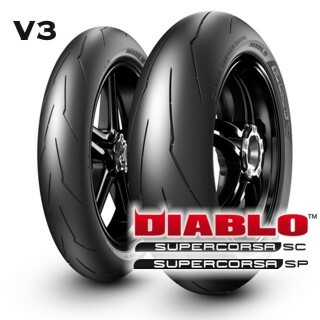 The Pirelli DIABLO Supercorsa SC tyres are grooved solutions intended for track use and dedicated to professional and amateur riders, as well as sport users seeking top spec performance on the track. These tyres are also available in various compounds in order to take on the different types of asphalt and weather conditions that can be found on circuits all over the world but, unlike the DIABLO™ Superbike tyres, no SCX or SC3 compound is available. For the front compounds, the criteria for use is not the same as that adopted for selecting rear compounds because, in addition to the temperature and the severity of the asphalt, it is important to consider the track layout and, above all, the rider’s riding style. In any case, generally speaking, when the track temperature increases, the compound tends to lose its compactness and rigidity, sometimes causing problems in movement during leaning. In this case, it is better to use a more rigid compound (such as the SC2). On the other hand, when the track is cold, the compound tends to become more rigid and this leads to a penalisation as regards grip, with possible under-steering and stability while braking. In these conditions it is better to use a soft compound such as the SC1. The SC3 compound, on the other hand, is the most versatile in that it allows for good performance and high mileage in all asphalt and track conditions. As for which rear compound to use, hot asphalt loses part of its natural mechanical grip, becoming smooth and more ‘slippery’. In these conditions a soft compound (such as the SC0) is necessary, as it can penetrate the asphalt surface as much as possible. Cold asphalt, on the other hand, tends to be more aggressive and rougher, offering more mechanical grip which, while on the one hand is an advantage, on the other hand it can cause the tyre to rip and tear, therefore requiring a compound with more mechanical resistance (such as the SC2 or SC3).